I will be participating in this year's PRINTFEST, the International Print Center of New York's 3rd annual Print Fair, which will be held at 524 West 26th Street (the former Robert Miller Gallery) in Chelsea. The fair runs from Thursday-Saturday, October 26th-28th. The opening reception is on Thursday from 5:00-9:00 pm. My work will be at the table for the New York School of the Arts. A cyanotype diptych entitled Passages V has been selected to be exhibited at Soho Photo Gallery, located at 15 White Street, New York, NY, as part of the 13th Annual National Alternative Processes Photography Competition. The exhibition runs from October 4th-November 4th. The opening is on Tuesday, October 3rd, from 6-8 pm. My latest installation, entitled We The People, will be exhibited in the 6th Annual CREATIVE MISCHIEF exhibition at the National Academy Museum. This year, for the first time, the show will include works not only by National Academy students, alumni and faculty but also by National Academicians, who are well established artists elected to membership by their professional peers. Join us as the National Academy Museum & School is transformed by the vision of the National Academicians, faculty, alumni, and students. Creative Mischief is supported in part, by public funds from the New York City Department of Cultural Affairs in partnership with the City Council, and by the generosity of private patrons and donors of the National Academy School. My latest series of paintings will be on view in a show entitled Indecipherable Messages, at Miranda Arts Project Space in Port Chester, New York. The opening reception will be held on Saturday, May 20th, and will be attended by the artists. 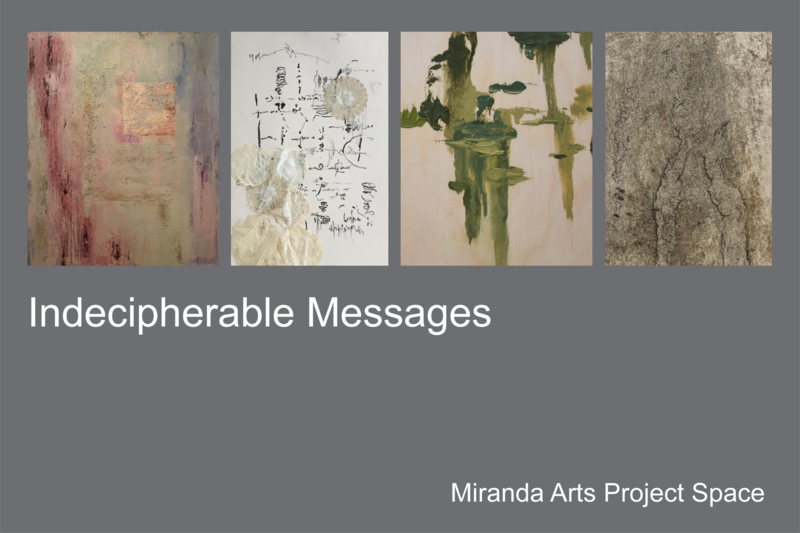 Miranda Art Project Space is pleased to present Indecipherable Messages, a group exhibition curated by Nadia Martinez, featuring works by Teresa Waterman, Esther Rosa, Michelle Bratsafolis, and Kathryn Cameron. They are working across medium including paintings, mixed media, sculptures, and installations. My work is currently on view in a group exhibition entitled Exchanges on Paper, to be held at the Miranda Arts Project Space in Port Chester, New York. The body of work in this exhibition comprises several series of cyanotypes and collages entitled Passages, which address the themes of time and change. 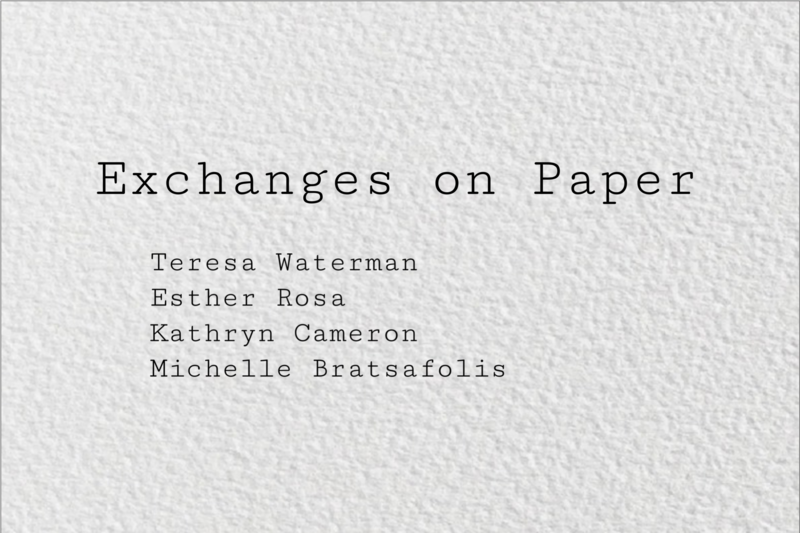 Miranda Art Project Space is pleased to present Exchanges on Paper, a group exhibition curated by Nadia Martinez featuring the works by Esther Rosa, Teresa Waterman, Michelle Bratsafolis, and Kathryn Cameron. 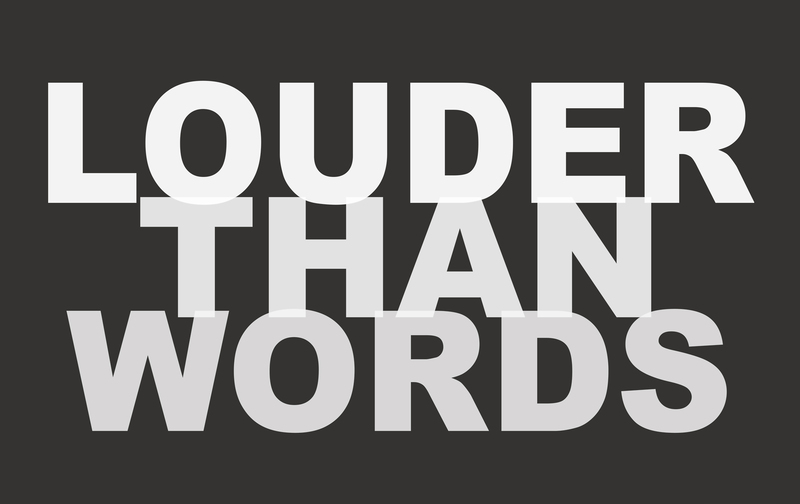 LOUDER THAN WORDS is a pop-up art exhibition taking place in Tribeca for one day only, Saturday, January 28th, from 1-5 pm. I will be showing a new body of work entitled We The People. Louder Than Words brings together an international team of artists from 12 countries who use different mediums to express their emotions, concerns, memories and ideas about life, nature, hope, decay, politics, world events, and humanity. The pieces contained in this exhibition speak for themselves, louder than any words that could describe them. A curated selection of work done across several mediums during my participation in the National Academy School's Studio Art Intensive Program will be on view in a final program exhibition beginning Thursday October 6th-Saturday, October 29th, 2016. The opening will take place at the Sonia Gechtoff Gallery at the National Academy School, located at 5 East 89th Street, New York, NY, on Thursday, October 6th from 6-8 pm. This year a cyanotype print from a new body of work has been selected to be exhibited at Soho Photo Gallery, located at 15 White Street, New York, NY, as part of the 12th Annual National Alternative Processes Photography Competition. The exhibition runs from November 2nd-December 3rd. The opening is on Tuesday, November 1st from 6-8 pm. My work will be on view from April 14th-May 8th at the National Academy School’s thematic exhibition displaying works on paper in black and white. My work is among the "Perspectives of 13" group exhibiting at the FRIDGE Art Fair from Saturday, May 7th-Monday, May 9th. 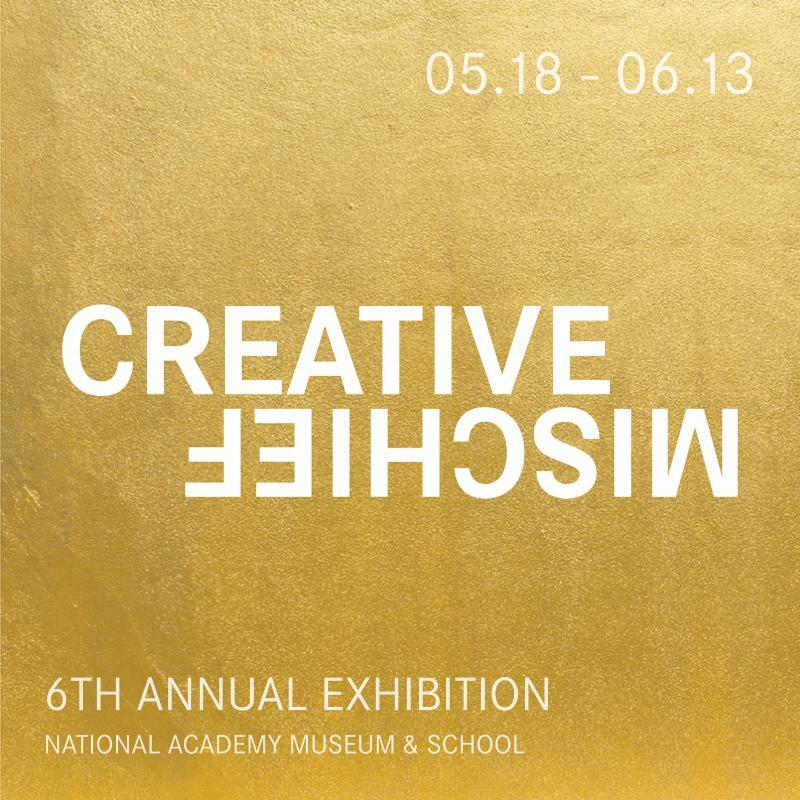 In May, I will be exhibiting a new installation in the 5th annual Creative Mischief Exhibition. I hope you will come and see the National Academy Museum & School transformed by the vision of the faculty, alumni and students especially for this distinctive exhibition. The 5th Annual CREATIVE MISCHIEF Exhibition. My work is being exhibited in a special exhibition entitled Emotion, Illusion and Discovery: Between Art and Fashion, at the Sonia Gechtoff Gallery, located at the National Academy School, 5 East 89th Street, New York, NY. The exhibition features select artwork as well as period clothing and accessories from private collections, and it examines the forms, colors and shapes which interface and synthesize the worlds of fashion and art. The exhibition runs from January 28th-February 28th. Another event where my work will be on view is the Bailey House Gala and Auction, to be held on March 10, 2016, at Pier 60, Chelsea Piers, New York, NY. If you are interested in purchasing tickets or learning more about this event, contact bhevents@baileyhouse.org. And, if you are a fan of sailing, on March 12, 2016, Oakcliff Sailing Center in Oyster Bay, New York is hosting it's Many Colors of Spring Art Show and Champagne Brunch, where I will be exhibiting a landscape painting for the first time. The sailing club is located at 2 South Street, Oyster Bay, NY, within walking distance from the Long Island Railroad Oyster Bay stop. For further information about this event, please refer to the website http://www.oakcliffsailing.org. My work is being exhibited in three galleries this fall. The first, a limited edition cyanotype print is being shown at Soho Photo Gallery, located at 15 White Street, New York, NY, as part of the 11th Annual National Alternative Processes Photography Competition. The exhibition runs from November 4th-November 28th. Next up, a painting of mine was selected by the American Artists' Professional League to be exhibited at the Salamagundi Art Club, located at 47 Fifth Avenue, New York, NY, as part of its 87th Grand National Exhibition. That exhibition runs from November 8th-November 20th. The third show opens on Wednesday, November 18th, at the Sonia Gechtoff Gallery, located at the National Academy School, where I will be exhibiting a sculpture. That show will run from November 19th-December 13th. CREATIVE MISCHIEF takes over again at the National Academy Museum! My portrait series entitled Talking Heads will be on view on the 4th floor gallery. Please join me and my fellow artists as the entire National Academy Museum and School is transformed by the creative energy and vision of students and faculty in this unique and exciting exhibition. Hope to see you there! Join us as the entire National Academy Museum & School is transformed by the creative vision, energy and artistic talents of its students and faculty in this exhibition. My work has been selected for exhibition in three upcoming shows. First up is an exhibition opening this week, on Wednesday, October 1st, from 6-8 pm at the National Academy Museum and School. The exhibition opening at the museum is called Beyond the Classical, Imagining the Ideal Across Time, and the companion exhibition opening at the school is called Reflections on Classicism. These companion exhibitions are scheduled to run through January 11, 2015. The museum entrance is located at 1083 Fifth Avenue. The school entrance is located at 5 East 89th Street. Next up, in early November, I will be showing two cyanotypes entered in the 2014 Alternative Processes Competition of the Soho Photo Gallery, located at 15 White Street, New York, NY. The opening reception is on Tuesday, November 4th from 6-8 pm. The exhibition runs from November 5th-29th. The third show is in mid-November. A painting of mine was selected for the American Artists Professional League's 86th Grand National Exhibition, which will be held at the Salamagundi Art Club, located at 47 Fifth Avenue, New York, NY. That exhibition will be located in the new upper and lower galleries of the Salamagundi Club, and it runs from November 10th-November 21st. The reception is on Sunday, November 16th from 2-5 pm.